WINNIPEG (June 19, 2018) — Today, DMT Group officially announces its corporate name change to RAPID RTC in response to its global expansion. What started in Winnipeg 22 years ago has grown to a global tech company with offices in Toronto, London, Paris, and Dallas. RAPID RTC will offer the same high-quality products businesses have grown to appreciate from DMT Group in digital lead management and chat, but this rebranding will help with continued global expansion and marketing efforts. “Our company was built based on the evolution of the digital customer journey over the past 20 years. It forged us to become the authority in digital lead management and, specifically, ensuring those online leads are being responded to in a fashion that meets the customer’s increasing expectations. We were the first to release a proprietary routing technology allowing customers to engage in online conversations with knowledgeable sales representatives in real-time. The demand for our products has grown steadily across Canada and internationally,” said Glen Demetrioff President and Chief Executive Officer of RAPID RTC. “Our customers recognize us by the name of our flagship products. It made logical and strategic sense to make the branding more seamless,” said Demetrioff. The benefits of RAPID RTC’s suite of products and services are not only customer-facing but also provide businesses with increased quality leads, more transparency into the value of online media spends and an ability to engage customers earlier in the sales funnel in order to convert them to purchases. RAPID RTC Lead Manager and Chat equip businesses with the tools to maximize and personalize experiences to every digital customer inquiry, while generating more quality leads in the process. “This is a very exciting time for the company as we share our products with new markets around the world. As growth continues, RAPID RTC’s commitment to innovative products, value-based pricing, and responsive customer service will remain our driving force,” said Demetrioff. 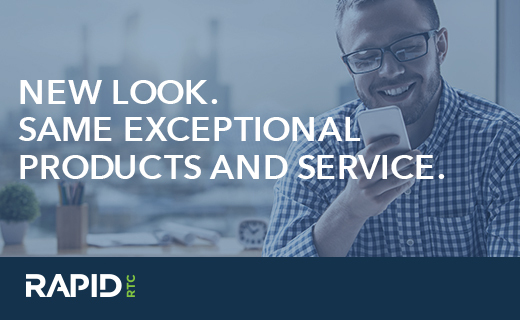 RAPID RTC is a multinational brand providing the global automotive, agricultural and other vertical markets with cutting-edge B2B SaaS-based solutions. With a continuing focus on improving businesses digital lead management practices and an enduring commitment to servicing our client base, our brand promise remains; bring value to our clients by maximizing their customers experience across multiple digital communication touchpoints. RAPID RTC is headquartered in Winnipeg, Canada, with offices in Toronto, Canada; Paris, France; London, U.K; Dallas, U.S.A. and is part of the DMT Group of companies. DMT Group was founded in 1996, and is privately held. All Rights Reserved © DMT Development Systems Group Inc. 2018. Confidential. RAPID RTC is part of the DMT Group of companies. Looks like you are in [current country]. Want to visit our website in your country?